Bluetooth smart (also known as Bluetooth Low Energy – BLE) is a new aspect of bluetooth designed to connect to a large number of devices in close proximity with ranges well over 100 ft. (This should not be confused with bluetooth audio which is limited to 8 pairings at shorter distances). Because BlueRail operates with minimum hardware (a bluetooth smart module and a smart device) the system is designed to grow. The software control application and the firmware in the module can be easily updated at anytime, with a goal of avoiding obsolescence. Many simultaneous connections – Bluetooth Smart has no defined limit on the number of simultaneous connections (trains) you can make. Perhaps we will find a limit someday, but for now it is safe to say you can use Bluetooth Smart to simultaneously run as many trains as you desire. Great range – Locomotives with a plastic shell have been operated at a range of 150 ft; locomotives with a brass shell had a range of 100 ft. Indoors the signal travels through 3 interior walls. We have tested these at crowded floor shows without seeing any loss of range caused by interference, wi-fis, or other bluetooth devices. Despite having a strong range, Bluetooth Smart is designed to accommodate many devices operating in close proximity. Bi-directional communication – One of the challenging issues in DCC is the lack of bi-directional communication. That is, DCC commands you send to your train are on a one-way trip. Your loco cannot speak back to you and give you feedback. This is very valuable for lots of reasons, including speed-matching and load/position management. With Bluetooth Smart, every loco is constantly in communication with the control app, and so, effectively in communication with each other, and can interact more effectively. Wireless firmware updates – This is one of the most valuable features of BlueRail. One of the biggest concerns in a hobby like model railroading is equipment that becomes obsolete. BlueRail involves no equipment – only a Bluetooth Smart module running BlueRail firmware and any Bluetooth Smart device (phone/tablet) running the free app. Because the firmware in the train can be updated wirelessly from your phone at any time, we can continue to add new features and expand the protocol knowing these features can be easily added to every train out there. Direct connection to a micro-computer (smart device) – This may not seem obvious at first, but connecting your train to a high-end computer (like a smartphone or tablet) opens up a new set of options on ways to enjoy your train. If you are interested in Operating Session simulations, recording and saving scripted train routines, or easily adding new content to your train, then you might enjoy the applications BlueRail is creating to allow you to experience your train in new ways. BlueRail has 20 years of experience creating software and user interfaces. We are very excited about the opportunity to give train control a great interface, simplify use without losing functionality, and creating new user experiences. 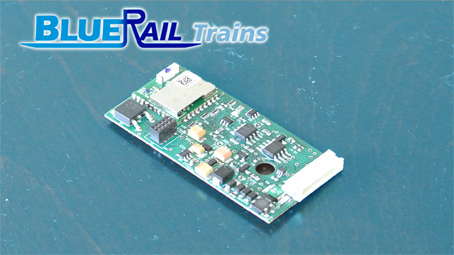 Support for battery or track power – BlueRail boards can be operated on any powered track within spec (DC / DCC). Because this system doesn’t rely on track signals, BlueRail is an excellent choice for Dead Rail (battery powered trains). Our “Battery Power” board contains two leads you can connect to a battery. The BlueRail system is compatible with Bachmann E-Z App trains, and the free BlueRail app is available in the appstore and Google Play store. Please view our videos for more information. to purchase a BlueRail plugin board use the BUY NOW link above.